will be our best-ever Wine County Century and Terrible Two events to come. The outpouring of generosity from our community, club members and friends was truly amazing, and we invite all to share fully in the accomplishment, especially as it took not years, but just a few months to achieve! Donations from 10 (!) other bicycle clubs from throughout northern CA, and as far away as San Luis Obispo. Click here for a list of their signature rides. Donors from throughout California and from as far away as New York, Chicago, Texas and Japan! With your support, SRCC and its warehouse has been "Renewed - Restored - (soon to be) Rebuilt," and we can add, Revitalized! Please note that the SRCC is a tax-exempt non-profit, but not a 501c(3) organization and therefore financial contributions to the club are not tax deductible. Thank you Rotary Club of Santa Rosa! 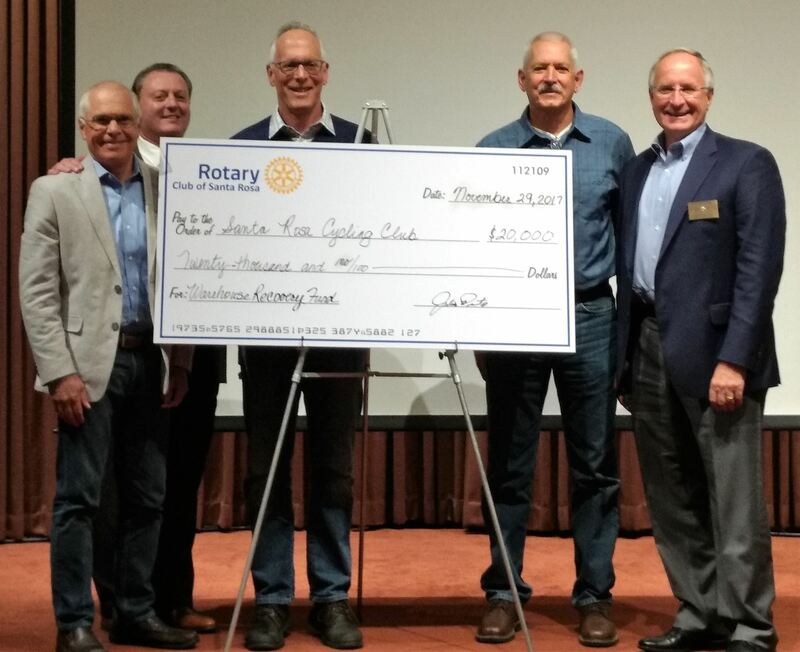 Doug Johnson and Jeff Kolin of The Rotary Club of Santa Rosa & Giro Bello presented a donation check for $20,000 for the Warehouse Recovery Fund on November 29, 2017 at the Rotary's weekly luncheon. On hand to accept the check were Bob Owen, President; Dave Smith, Treasurer; and Doug Simon, Warehouse Chair. was a smashing success and raised approximately $6200 for the Tubbs Fire Warehouse Recovery Fund! Thank you to all those who donated items; attended the event; purchased auction items; provided additional funds at registration; and to the event committee! 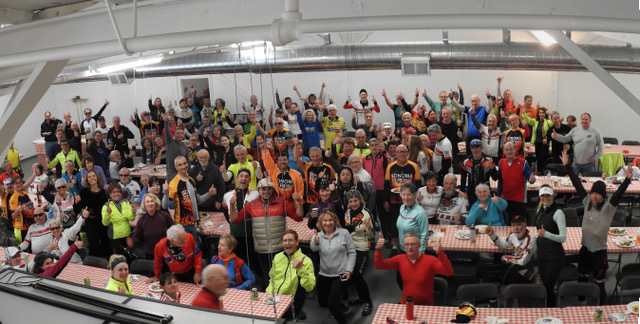 Thank you Marin Cyclists Club! Lorraine Trautwein of Marin Cyclists presented a $5204 donation check towards our Warehouse Recovery Fund at the Holiday Dinner & Fundraiser on Friday, December 8, 2017. The check was presented to Bob Owen, President; Peter Verbiscar-Brown, Fundraising Chair; and Bridgette DeShields, Event Chair. Charlie Wilson - ACTC Enrique & Celia Rojas Joel King Michael Ogul Santa's Little Helper Murray Engineers, Inc.